The Baltimore Sun's art critic finally takes a trip to Bethesda and reviews the great Connie Imboden exhibition at the new Heineman Myers Gallery. Next Friday is the second Friday of the month and thus it's the Bethesda Art Walk with 13 participating venues and with free guided tours. We will open "Compelled by Content II", which is an exhibition of contemporary narrative glass curated by Catriona Fraser. This is the second iteration of an annual group exhibition of emerging and established contemporary fine arts glass sculptors from around the nation who use glass as their main medium to convey narrative ideas in a genre generally only associated with bowls and vessels. 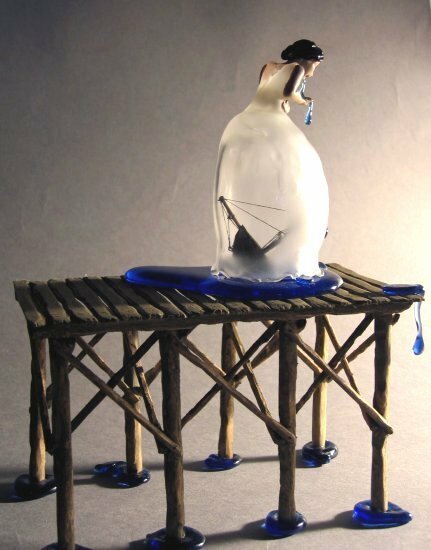 The 2005 exhibition established a new footprint and direction for glass, and began the task of pushing it away from pretty, decorative art and towards narrative work with context and meaning. It generated a substantial amount of discussion, both pro and con, which at the last count included over 80 pages of comments on various art websites as well as several reviews in the printed media. This exhibition brings the focus of the art to a place where it is no longer just about glass, but about artists who use glass in their process to tell stories, discuss events, narrate biographies and make social statements. The exhibition includes work by Jeanne Brennan, Robin Cass, Mel George, Michael Janis, Carmen Lozar, Syl Mathis, Liz and Lindsey Mears, Michael Rogers, Alison Sigethy and Tim Tate. An opening reception for the artists, free and open to the public, will be held on Friday, April 14, from 6pm - 9pm as part of the Bethesda Art Walk. In the below piece, titled "Lost" by Carmen Lozar, a damsel in some distress, gently vomits from a pier.